Eagle Peak Middle School’s “Unbroken” yearbook was one of only 413 yearbooks selected from approximately 2,000 entries to be included in the 2018 Jostens Look Book, a book that celebrates “the best of the best in yearbook design,” according to Eagle Peak digital media teacher and yearbook adviser Elizabeth DeVinny. The Jostens Look Book is a collection of page designs and photographs from outstanding yearbooks distributed to schools each year to inspire future designs. This year’s panel of judges was comprised of nationally recognized scholastic journalism professionals and award-winning yearbook advisers who selected the best examples of yearbook spreads and covers to make up the 304-page Look Book. The award winning 2016-17 Eagle Peak yearbook, featuring the theme “Unbroken,” was created by student editors Jose Gallegos, Joshua Harding, Savanah Dolce, Kassidy Galloway, Tehya Zacarias, Kylie Kornegay, and Melina Grippi, in conjunction with 80 digital media classmates under DeVinny’s direction. DeVinny said the Look Book displays examples of creative themes, cool covers, dazzling designs, relevant coverage, storytelling copy and action-packed photography. 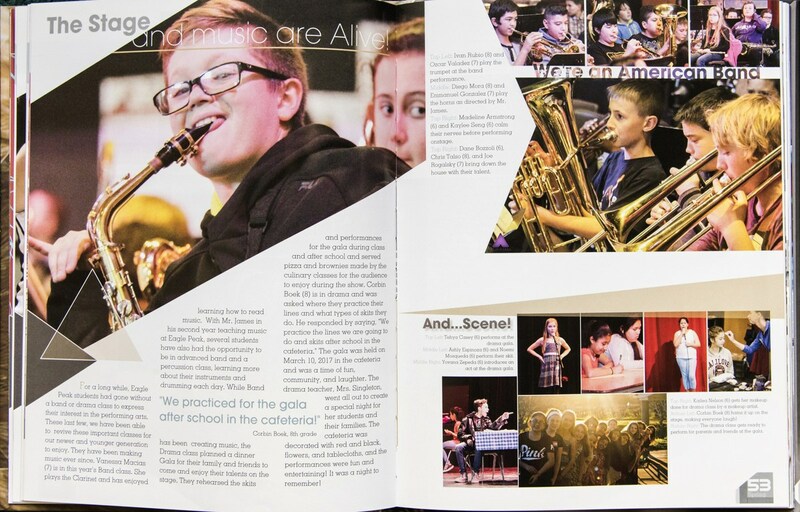 Along with design excellence, the annually published Look Book honors the important role well-crafted yearbooks play in helping schools chronicle the experiences, stories and achievements most relevant to students and that academic year. DeVinny said, “The kids know what they’re doing. I provide some coaching and mentoring, but they have the skills.” Those skills include more than writing and photography, as required by the yearbook staffs of old. Using an app on their smartphones, the yearbook becomes an interactive experience, featuring videos and other online content. DeVinny and her yearbook staff received a copy of the 2018 Jostens Look Book and a plaque from Jostens to recognize their outstanding achievement.